Total Loss Farm in Guilford, Vermont, was and is a wordy place. Its hilly acres and flimsy buildings provided a refuge from a riven country, a place to grow paragraphs and stanzas, among the tilled rows of the market garden. Peter Gould’s first novel Burnt Toast was a youthful exploration of this mythic turf. Peter left the farm to pursue love and work. 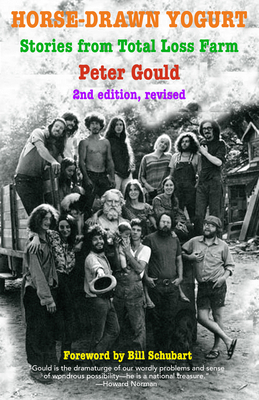 In Horse-Drawn Yogurt, Peter returns to offer his take on how we lived in times that seem exotic, yet oddly familiar, in this second edition, with three new stories and an introduction by Vermont author Bill Schubart. Gould is eloquent, whimsical, critical, musical, magical, and tender. The new stories in this second edtion are gems with additional line drawings by the author. Bill Schubart has lived with his family in Vermont since 1947. He writes about Vermont in fiction, humor and opinion pieces. His latest book is Lila & Theron.